I hope my latest blog finds you fine and dandy. I was rummaging through a few old photos recently and came across the one you find above. 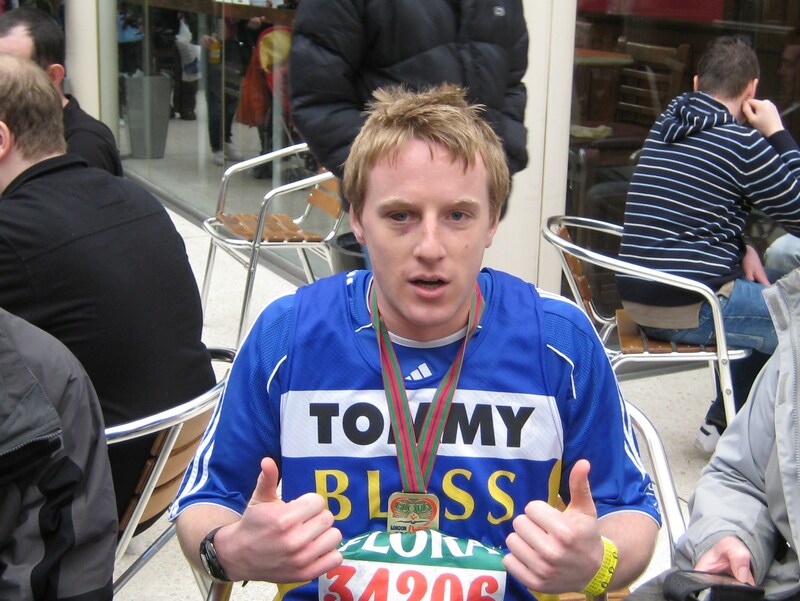 This is a photo taken minutes after running the London Marathon back in 2008 (as you can probably tell by the ghost like figure I resemble!). [subscribelocker] Simply by looking at the image for a few seconds, the memories, feelings, emotions and physical pain of that day (and the months prior preparing for it) came flooding back. It is moments like this that we remember for a lifetime. On reflection, it has inspired me to think long and hard about what big challenges I want to take on next, because the bigger they are, the more memorable and the greater the satisfaction. Moving house, inventing a new product, running a marathon, starting a business…all massively memorable moments that we undoubtedly remember for a lifetime. However if you asked yourself to remember a random date 6 months ago…it is unlikely that you remember exactly what you did. Big, memorable moments are stored in the long term memory bank eternally and sculpt the life we will eventually look back upon. We remember our most memorable moments, so let’s set to work creating more of them, have so much to be proud of. Keep adding to that list of things you have already achieved, keep striving for more. I understand there is still a long way to go before retirement for many of us but I know for sure that I want to be in a position to tell my future children and grandchildren the most amazing stories. So set more challenging goals, dream bigger, create even more memorable moments in your life that you can constantly reflect on with pride and a sense of accomplishment. Why do all people at the top of their game write autobiographies? Because they have so many memorable moments to write about that interest people. How would your autobiography fair? Do you have enough to fill a book? I certainly don’t! I could possibly fill a few chapters but I have a long yet exciting way to go! Which is why I am constantly planning bigger and better plans…to create my journey to a more memorable future…setting up new businesses, writing a book, learning new skills, travelling to more places, setting new physical challenges for myself, starting a family. There is so much we can do, and 99% of the time we are living well within our means, and we all have the ability to challenge ourselves so much more, we just have to do it. How may you ask? Well many of my other blog’s contain information on this but quite simply it’s setting a challenging goal (something you have always wanted to achieve but for whatever reason haven’t), agreeing on the action needed and then having the belief and conviction to see it through to its accomplishment. The one thing I love about coaching, is that I get to see first hand, the massive improvements people can make when they simply put their mind to it. My attitude on life and my whole mindset has been sculpted by listening and following advice of those I look up to. This has come via my family, close friends, mentors and from reading many autobiographies of successful people. The one trait that I find most common in life’s real achievers are that they are action oriented. They have a vision and are not afraid to put the work in to realize this. So I must practice what I preach, so in a few months time I will be embarking on some new and exciting projects I plan to roll out and I will share them with you as and when the time comes. I write this blog solely to help inspire others to do more, achieve more and become more and if I help just one person then that is enough reward for the time spent writing the blogs (which I enjoy)….so as ever it would be wonderful to hear about your own personal plans and ambitions. Excellent and inspirational post, dear Bro! Bro, you are definitely spot on about dreaming and achieving bigger things in life as it all depends by our positive attitude when we encounter setbacks along the way, we can choose to give up or to learn the lesson to sculpture our personality by becoming a better person. I personally found that one of the most effective and efficient way to achieve our goals is to share them with close friends and family (as I did with you via sms and with this comment) as they would be there to support and encourage us along the journey. Great stuff Tom – really motivating. Thanks Tom, wise and inspiring words. I can vouch for all you wrote as it describes my approach exactly – and see what I achieved so far (biography attached). But I never look back, nor glory in past achievements. There are always new interests and ways we can help in the world. The one thing I would add to your write-up is ‘always help others’ with the attitude of wanting nothing in return, just the pleasure of leaving the world a better place. Oh, apart from my medical research I also invest, and have developed my own global macro trend following formula – which I am always seeking to improve. And I hadn’t traded forex or used spread bets so I did the K2A 1 year UW course recently. Great fun, great education. It will likely take me several more years to truly master it and I will persevere till I do.